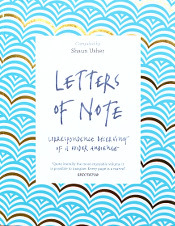 Letters of Note: Will you please have a brilliant idea? Will you please have a brilliant idea? 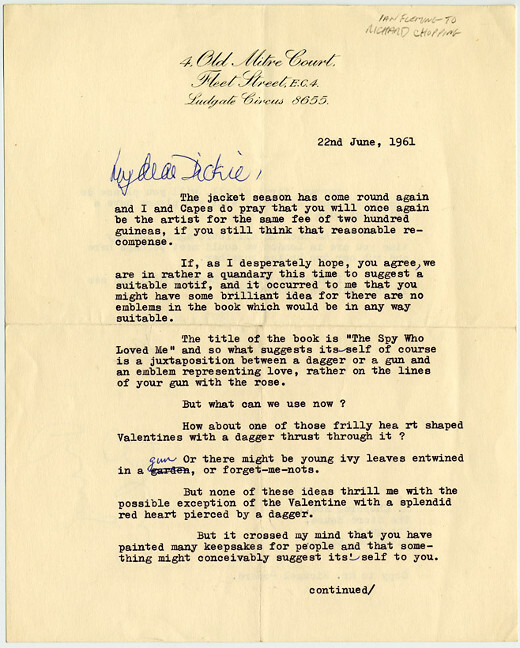 From the office of author Ian Fleming in 1961, below is a letter requesting the services of artist Richard Chopping, the man responsible for creating the iconic dust jacket illustrations that helped strengthen the James Bond brand. Chopping's trompe l’oeil paintings - each of which took a month to produce - had already featured on four Bond novels, and having just finished writing The Spy Who Loved Me, Fleming was keen to secure his talents yet again. 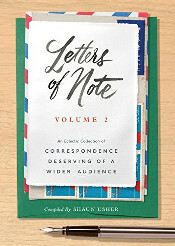 The finished cover can be seen here. He was a mean and vain man. I regret having anything to do with him. The paintings I did for his dust jackets are now worth thousands and they sold as many books. But he would not even let me have me royalties. Quite honestly, I'm sick to death of it all [...] I have been swindled all the way along the line. I was quite fond of doing the early work but it became a bore and I hate the books. The jacket season has come round again and I and Capes do pray that you will once again be the artist for the same fee of two hundred guineas, if you still think that reasonable recompense. If, as I desperately hope, you agree, we are in rather a quandary this time to suggest a suitable motif, and it occurred to me that you might have some brilliant idea for there are no emblems in the book which would be in any way suitable. 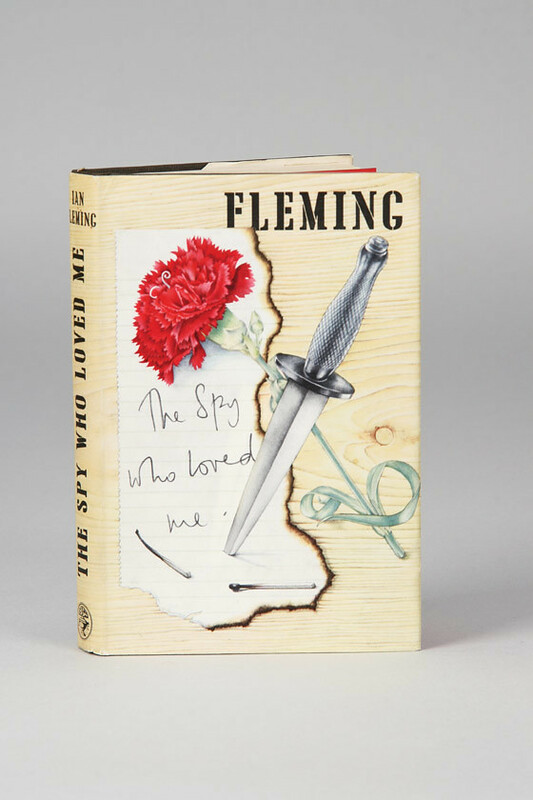 The title of the book is “The Spy who Loved Me” and so what suggests its-self of course is a juxtaposition between a dagger or a gun and an emblem representing love, rather on the lines of your gun with a rose. But what can we use now? How about one of those frilly heart shaped Valentines with a dagger thrust through it? Or there might be young ivy leaves entwined in a garden gun, or forget-me-nots. But none of these ideas thrill me with the possible exception of the Valentine with a splendid red heart pierced by a dagger. But it crossed my mind that you have painted many keepsakes for people and that something might conceivably suggest its'-self to you. Anyway, first of all, will you please do the jacket and, secondly, will you please have a brilliant idea? I am back on all fours again and any time you are in London we could meet perhaps here and rub our two brains together. 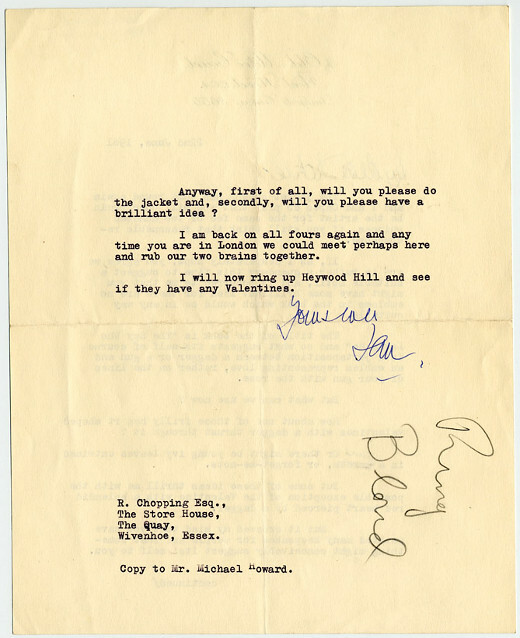 I will now ring up Heywood Hill and see if they have any Valentines. Copy to Mr. Michael Howard.